‘Could you pick up some Greens, Beans and Grains from Trader Joe’s?” That’s not confusing, right? Trader Joe’s Green, Beans and Grains could be anything, with a name like that. What it actually is, is a West African inspired curry-like, vegetarian dish. In this case, the greens are kale, the beans are garbanzo beans, and the grains are couscous. Also there are peanuts, which are technically legumes, but whatever. They don’t get to be in the title. These tasty components have been simmered up in a heavily spiced tomato based sauce that tingles and excites the tongue. Despite not having any meat in it, this dish manages to satisfy quite nicely – a result of the complex, savory spices as much as the hearty, filling beans and grains. The strangest thing about the name that Trader Joe’s choose for the product, is that it falls so short of actually describing the contents of the dish in any meaningful way. “Greens, beans and grains” is so vague and non-specific that it hardly serves as a product title at all – greens, beans and grains can show up in so many dishes and so many combinations, that this title only obfuscates the nature of the dish rather than help you out in any way. It’s like if Taco Bell decided to call one of their dishes “Cheese, Beans and Beef” – it effectively signifies nothing and sows confusion. It’s a sort of anti-product name really, confounding innocent shoppers and muddying the waters of cognition with its nebulous semiology. Here’s the thing – if the dish is so West African, as Trader Joe’s themselves claim on the side of the box, shouldn’t there already be a name that it’s known by? Trader Joe’s looooves attaching strange, exotic names to their food products, often without explanation, such as their Pa Jeon, Uttapam, Kouigns Amman, Dukkah… I could go on. Why not do that again here? 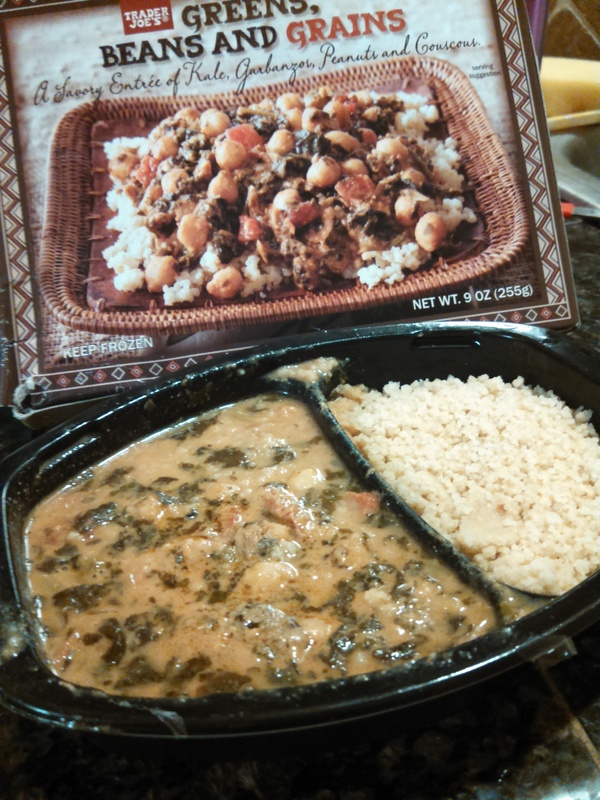 The fact is, Trader Joe’s has gone somewhat rogue with West African cuisine in this dish. The word “inspired” on the side of the box is meant in the same way that horror movies about ghosts that make people’s heads explode are “inspired” by true events. The germ of the idea comes from traditional West African dish maafe – or peanut stew. Traditionally maafe is made from peanuts, collared greens, tomatoes, onions and a selection of spices such as chili pepper, coriander, garlic and cumin. Trader Joe’s made the radical decision to swap out the collared greens for kale and, strangely, the peanuts for garbanzo beans, but the spices and the tomato and onion base are still there. It’s this tasty stock that makes the dish worth eating, as well as connecting it to its African roots. Really, given how much the dish has deviated from its West African origin, TJ’s has shown remarkable restraint in giving the product a lackluster name instead of just sticking “Trader Joe’s Maafe” on it, and being done with it. That shows integrity, Trader Joe’s Marketing Department. Kudos. It may not be, strictly speaking, a West African dish – but Trader Joe’s Green, Beans and Grains is interesting enough to make a strong case for its own existence in the frozen food aisle. Would I Recommend It: Yes, it’s pleasantly spicy and reasonably healthy. Would I Buy It Again: I very well might – this would be an easy way to dress up boring meat. Final Synopsis: A spicy, West African curry – with couscous. I just ate this last night. I really liked it and its spicy kick. I agree its name kind of bores it down, which is why it took me longer to try it say than the Eggplant Parmigiana (not to be confused with the other TJ’s dish Chicken Parmesan). And yes I would definitely eat it again! It looks different then the curry from asia. Is there any meat inside of it? I LOVED this!! Such a great filling combo that cooked up so quickly. Amazing flavor, the peanuts really made it. it’s pretty tasty actually, though not attractive. Also your “it’s” should be “its” in most cases in this article. This was amazingly good. Im going to go back and stock up. One of the best if not the best I have had from TJ’s!! LOVE! !